Lauren M. Batterham focuses her practice on Commercial Finance matters. While attending Loyola University Chicago School of Law, Lauren was a lead articles editor for the Loyola University Chicago Law Journal, the symposium editor for Annals of Health Law and a constitutional law academic tutor. Additionally, she received a Beazley Institute of Health Law and Policy Fellowship and is a member of the Alpha Sigma Nu Honor Society. She also received CALI Excellence for the Future Awards in Legal Writing, Advocacy and Administrative Law. 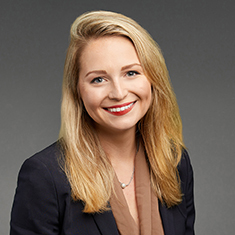 Prior to joining Katten, Lauren served as a judicial extern to the Honorable Sanjay T. Tailor at the Circuit Court of Cook County and as an advocacy research center extern at the American Medical Association. Shown below is a selection of Lauren’s engagements.